For the most part, Kitas is tribesland. Even large cities harbour tribes, sometimes by other names, like house or clan. Few titles are hereditary, most have to be earned, and powerful peoples chase off irresponsible rulers. Absolutism is very rare and looked down upon by the neighbours; tyranny, while existent, will be attacked by those living nearby and feeling threatened. Honour compels rulers to do their best, and folklore gilds the memory of a good ruler; nobody wishes to be remembered as the Master of Famine, or the Queen of Pain. "It was quite the coup when the Crowned put down her rights and duties, having been elected time and again for two decades. She claimed a country as powerful as Brighthold must not fall into idle content with its leadership, and resumed her position as cavalry general." Mostly, a monarch or chieftain will be elected by a council; this will sometimes consist of nobles and accomplished celebrities like sages and warriors; other times of the entire tribe or city's population. City states sport democracies giving a vote to anyone of age, sanity, and citizenship. While children of previous rulers often have good chances to assume power, they are not natural choices. In the many nomadic tribes, any accomplished "hero" can attempt to get the tribe's support for rulership, although they don't often make young people chieftain. 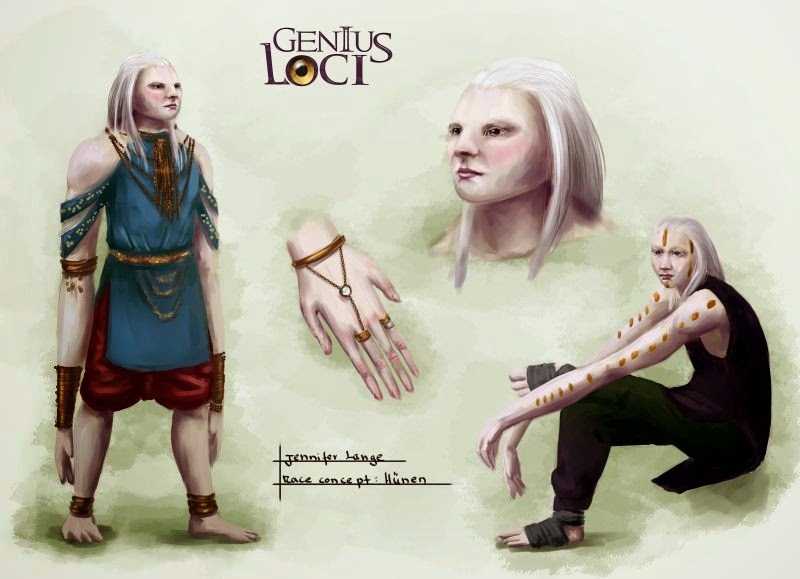 I describe Genius Loci as a "riddlesome fairy-tale". The fairy-tale part is that nobles are noble indeed - not the despots of dark fantasy, irresponsible and only driven by their own desires. Communities are small and one's deeds don't go unnoticed - valor is rewarded, crimes are punished. Every ruler feels the weight of the crown, and some are even treated supernaturally to be the good rulers the people needs. Btw, "Brighthold" is called "Lichtfeste" in German, a difficult translation (literally: Light-Stronghold. Bah.). Standing an average of two meters, hunes are the tallest people after raganaj. They are pale, almost white, and sport two thumbs - one on either side of their delicate but strong hands. Hunes are mute. They can make sounds but not form words, although they understand perfectly well, and sophisticated sign languages help them to communicate. Hunes travel by branch, swinging along with great strength, and in the thick forests of Gdera achieve a good speed, and because of this they mostly live in Gdera. Hunes love eating, but for some reason, however much they eat, they never grow fat. "Bedanga is called the silent lands for its majority of hunes, and indeed it's very quiet - certainly not because of their political insignificance... They have a surprisingly lovely singing voice, though." Hunes are a gentle and understanding people. They like company but can well be alone; because of their muteness, they are often granted a few childlike exceptions from social expectations - a role that not all hunes fancy, and there are notable warriors, scientists, and speakers among them. The royal family of the Gderan state Bedanga are hunes. Their muteness lessens somewhat in the Years of Sorrow, but no hune has ever spoken outside the Area. "The third bowarcher might have been a hune. Or an albino, the records aren't clear. But then, aren't hunes albinos?" The name is a phonetic comparison to the German word Hüne, which means a very tall person, but giant is too tall, so here we are. Speak: hoons. Hunes were among the major races once but when I made them mute I moved them more to the sidelines, where they now hang out with other known but mysterious folk, like the mul'ahman. Mostly called the Lower forest, this is the most "average" forest of Gdera. However, when called "the forest with no tricks" by outlanders, the natives laugh. The Lower forest is infamous with its inhabitants for its cunning beasts, fast overgrowth, and devious predators. No other forest is as skilled in illusionary art; abandoned settlements are quickly covered up, and so, many secrets lie beneath the thick blanket of moss. The Lower forest isn't picky about climate and is the first to reclaim devastated lands, and holds the soil the best. Minerals colour the wood of many tree species, which sell well and sometimes name the country, like Whitewood. "When Gal was founded, they found ruins in the building sites. When digging deeper, there were layers of them; eventually an elder mapmaker discovered there had been five villages on the same spot before. Why they were abandoned, nobody knows. Or if." The natives take pride in being generalists - they may not be as specialised as other forests' inhabitants, but they know something of everything. The many changes throughout the year encourage adaptability and cunning; the natives are admired teachers and engineers, and feared generals and politicians. "That a nureewing should be smarter than a person is only funny until one distracts you, while a gang of perwons steals your foodpack and you find them sharing the loot in the trees." 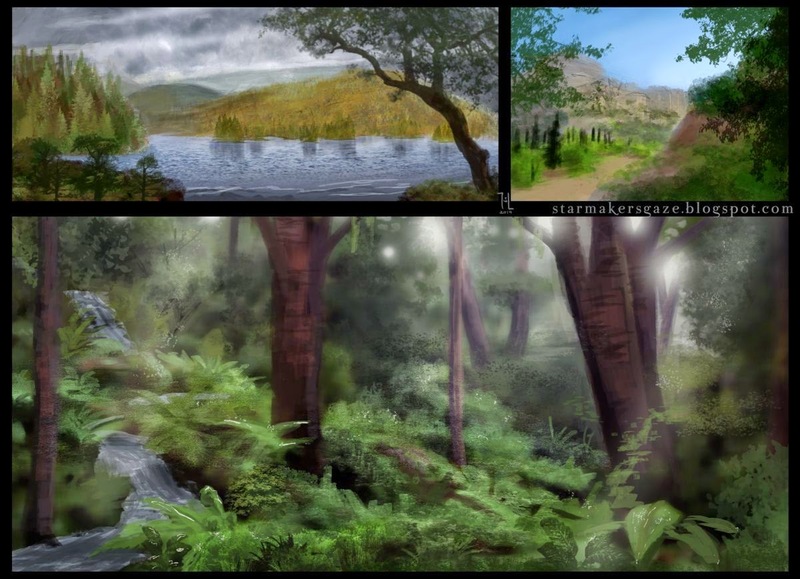 With this, all types of forest on Gdera have been described. Ranarh is the artistic alias of sci-fi/fantasy painter, illustrator, and concept artist Jennifer S. Lange. She enjoys spaghetti, lightsabers, and jellyfish. Jennifer lives in northern Germany with her fiancè and a blackbird. As of 2017, editor Kody "Corvell" Cowell is taking care of continuity.